Faversham's first workhouse was opened in 1722 on Church Street. In 1777, the property could house up to 70 inmates. The need for more space resulted in its relocation in 1822 to the hospital of former army barracks at Ospringe. In 1832, it housed 75 inmates, of whom 31 were under 14 years. A workhouses was in operated at Davington by 1748 (Hitchcock, 1985). However, it did not feature in a parliamentary report of 1777 which recorded parish workhouses in operation in Boughton under the Blean (for up to 40 inmates ), Buckland (10), Linsted [Lynsted] (100), Sheldwich (16) and Throwley (12). A house at the north side of Workhouse Road was Throwley's parish workhouse. The property is still known as the Old Workhouse. In 1790, a Gilbert Union was formed by the parishes of Badlesmere, Boughton-under-Blean, Challock, Preston, Selling and Sheldwich. Later members were Norton (from 1792), Molash (1813), Dunkirk (1823), Leaveland (1823), Stone (1823), Goodnestone (1828), Harty (1829) and Davington (1831). The union used a workhouse at Hogben's Hill, Selling. 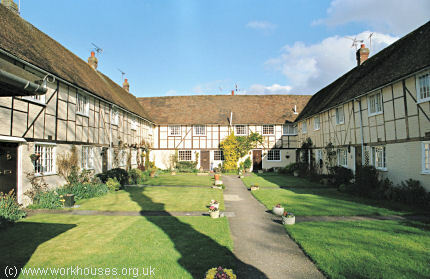 After its conversion to cottages, the property became known as Harefield Square, now just The Square. 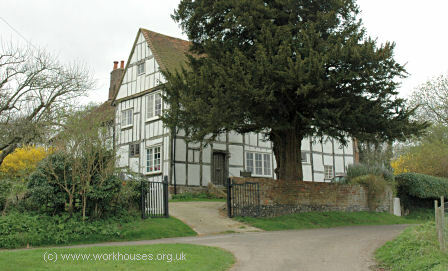 A large house dating from 1587 situated on Bogle Road, Lynsted, was once used as the parish's workhouse. Lynsted formed a Gilbert Union with Teynham in about 1816. 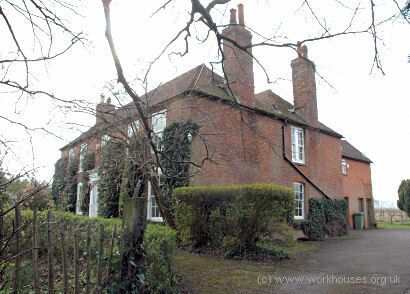 Lynsted former parish workhouse, 2005. Ospringe had a purpose-built parish workhouse from 1792 located at Painter's Forstal. Former Ospringe workhouse at Painter's Forstal, 2005. County of Kent: Badlesmere, Boughton-under-Blean, Buckland, Davington, Doddington, The Ville of Dunkirk, Eastling, Faversham (2), Goodneston, Graveney, Hernhill, Leaveland, Linstead [Lynsted], Luddenham, Newnham, Norton, Oare, Ospringe, Preston-next-Faversham, Selling, Sheldwich, Stalisfield, Stone-next-Faversham, Teynham, Throwley. The population falling within the Union at the 1831 census had been 14,845 — with parishes ranging in size from from Buckland (population 15) to Faversham itself (4,429). The average annual poor-rate expenditure for the period 1831-4 had been £17,957 or £1.4s.2d. per head of the population. The former workhouse buildings have now been completely demolished and a housing estate was erected on the site in around 1995. Faversham Gilbert Union: Minutes (1790-97); Ledger (1823-34); Relief list (1829-35). Faversham Poor Law Union — holdings include: Guardians' minutes (1835-1930, with gaps); Ledger (1835-1930, with gaps); Births (1891-1915); Deaths (1835-66); Creed register (1869-1905); Admissions and discharges (1835-1929); Indoor relief books (1836-48); Punishment books (1852-1937); Register of children boarded out (1910-29); Register of girls sent to service (1913-26); Paupers' friends (1902-29); etc. Faversham Union Workhouse: The Early Years 1836-1850 by John Stevens (2003, Faversham Society, Faversham Paper No. 80. Ospringe Workhouse Admissions and Discharges 1805-08 & 1827-35 by Ray Godfrey.